Great for serial killers or zombies! Once there was a zombie who was extremely hungry. He didn't really understand that he was a zombie though, his friends just told him he was. That was a problem. So, he went around eating hamburgers and was confused why they always filled him up. He decided maybe trying raw meat would be better for his hunger for flesh. But, after contracting salmonella he decided to become a vegetarian. His friends then realized that he was not a zombie at all! So, he had to fake it. 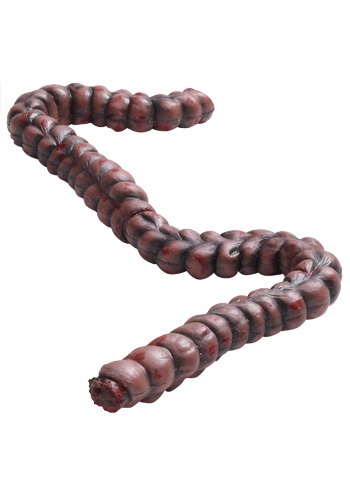 He bought the Bloody Zombie Intestines to drape around his neck so everyone though he was a real zombie. The 10 inch long intestines squishes like real guts, and has blood spatters and texturing to look real. Scare out your friends with a bloody accessory.